MotoLanna SuperTuff aluminum alloy swingarm. Designed to fit a drum brake Yamaha SR500, SR400. On pre 2000 SRs, the brake linkage may require modification to gain clearance. On the TT and XT, some modification of the brake linkage may also be necessary. When using original XT/TT shock absorbers, clearance issues at the shock mount cutouts is common. 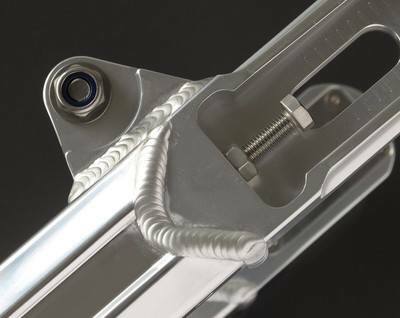 We offer a version with welded rather than machined shock mounts to alleviate this issue. Available in silver, black, titanium, and polished raw aluminum finish. Weight is approximately 3.5 kg including axle, spacers, and bearings as shown. Note: The welded shock mount swingarm features round chain adjuster blocks, not the rectangular ones pictured. Please note: The latest version features a round nylon chain protector fitted around the pivot, rather than the flat black one pictured.